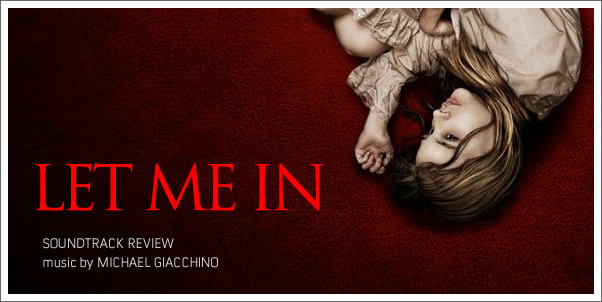 Following an Academy Award for UP and then his final duties for the long running LOST series, MICHAEL GIACCHINO makes his first foray into the horror genre in LET ME IN. GIACCHINO is fast becoming one of the Hollywood film scoring giants with an aura of reliability in his composing abilities. Therefore seeing him attached to a remake of a universally lauded Swedish horror comes as no surprise. LET THE RIGHT ONE IN was released in 2008 to critical acclaim across the world. A fresh approach to the vampire genre and outstanding performances from the cast meant that the Swedish production was a sure-fire hit. Following recent trends of film remakes, Hollywood studios felt the need to reinterpret LET THE RIGHT ONE IN, and so LET ME IN was born. Telling the story of a twelve-year-old boy's friendship with a vampire, LET ME IN manages to elevate itself above the wealth of hashed out remakes in recent memory, perhaps largely due to the shot-by-shot following of the original. A fine score from Swedish composer JOHAN SÖDERQVIST accompanied the original. SÖDERQVIST’S compositions interspersed a distinctive optimism among the terror, while GIACCHINO’S interpretation of the story has taken a somewhat more formulaic path into horror territory.